Kitchen! Kitchen! : clear soup... just that! .....at.....kitchen! kitchen! clear soup... just that! .....at.....kitchen! kitchen! 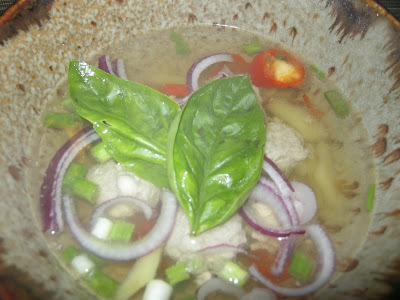 garnish with basil leaves to add freshness to the soup. It turned out to be very light, satisfying, and delicious. So I extended this kind of soup for the Saturday and Sunday dinner for myself to indulge in and soothe my sore throat as well. Paired with a toasted buttered baguette is perfection. 1/4 of red chili cut into rounds (add more if you want more heat) or do not add at all. In a small pot add 2 cups of water or unsalted chicken stock; add the ginger, garlic, and chili. Let boil and add the turkey meatballs. Scoop out the "scum" on the side; add a pinch of salt and let simmer for 10-15 minutes. Add the scallions and transfer to a bowl - add a teaspoon of Tamari soy sauce and garnish with basil. ( you may season this according to your taste). This is a make me feel good soup any time!